When it comes to the characteristics of the soil, groundwater, and rock, no two sites are the same; we must develop a new engineering properties matrix for every project that we undertake. Foundations tell no lies. In the end, the excavated, driven, drilled, bored, vibrated, or punched foundation units will let us know if we got it right, and there is no debating the findings of these steel and concrete judges. How often does misinterpretation of soil, rock, and groundwater conditions create problems? I attempted to get an answer by surveying more than 200 geotechnical engineers who consult, design, and build structures that require geo-characterization. My survey included the membership of the Deep Foundation Institute and the Pile Driving Contractors Association in preparation for a talk on this subject last fall. The answers I received were not very pleasing to my geotechnical engineer ego. 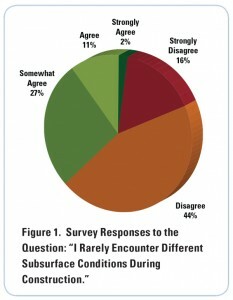 Most of the surveyed experienced professionals opined that subsurface conditions are expected to differ from what the characterization work indicated them to be (Figure 1). According to these respondents, when it actually does appear that the subsurface has been properly characterized for a given situation, this “no surprise” is that “best surprise” that we relish. What Do Our Clients Deserve? Clearly, a client deserves an efficient and effective geotechnical investigation for their project; one that is not bloated with unnecessary work scope or inefficient practices. An impetus to minimize fees, however, can result in a work scope that simply does not allow the value of a good geotechnical engineer to be exposed. When I see a request for proposal that is clearly seeking to find the lowest-fee geotechnical consultant to perform a project, I think of a simple, three-word response: You deserve better. Our clients deserve the work of a geotechnical consultant who understands their project and seeks to accomplish the proper work scope with the use of innovative methods, appropriate staff, and sufficient scope. Our resistance to selection based solely upon fees may, at first, appear to be self-serving. The benefits of innovative exploration, gathering of sufficient data for efficient design, construction, or construction monitoring techniques may not be understood. Foundation performance consistent with design expectations. The mere mention of the word “ethics” conjures up a myriad of feelings for engineering professionals. Understanding that, let’s explore the geotechnical engineer’s ethical challenge related to bidding our services. 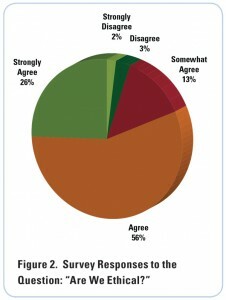 As shown in Figure 2, those respondents overwhelmingly agree that the profession is holding paramount the safety, health, and welfare of the public. However, below the surface of that opinion lies a more introspective aspect of our ethical responsibility. Such was exposed by written comments which begged the question of the geotechnical engineers’ responsibility to minimize overall costs to the owner, or to the public, by being innovative and not overly conservative. Simply meeting a client’s request for a low cost geotechnical engineering investigation will not do that. The National Society of Professional Engineers’ Code of Ethics (as well as every state’s engineering regulations) states the fundamental tenet that our profession is dedicated to the protection of the public health, safety, and welfare. Therefore, if one considers our ethical responsibility to ‘conduct ourselves honorably, responsibly, ethically, and lawfully so as to enhance the honor, reputation, and usefulness of the profession’ (as NSPE’s Fundamental Canon No. 6 states), we are bound to protect the economic interest of our client and the public. This is what enhances the value (i.e., the usefulness) of our profession. 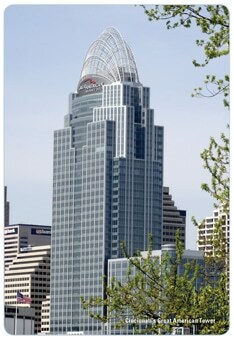 To explore this ethical situation in a real-life example, consider Cincinnati’s Great American Tower. This 41-story structure is the crown jewel of Cincinnati’s downtown. Its very existence is, at least in part, due to the creativity of geoprofessionals, the forward-thinking client, and their ability to overcome a low-bid environment and benefit from innovation in exploration and in deep foundation design. The structure utilized an innovative approach to the use of deep foundations to limit settlement of a mat foundation for the iconic structure in downtown Cincinnati. The geotechnical exploration and design fees were not the lowest price that could have been procured. The innovations required specialized geotechnical testing and sophisticated modeling of the proposed foundation elements. This approach saved more than $1 million in foundation costs over a more traditional approach, and shaved three months off of the construction schedule. We can ethically serve the interests of our clients, and the public in general, by continuing to exercise proper judgment related to work scope for site characterization, engineering, and construction monitoring services. The value of this for the well-informed client far exceeds the fee for the services rendered. As we demonstrate such value and develop the client relationships that allow their confidence in us to grow, no surprise will be — in and of itself — no surprise at all. This is just one man’s opinion. Continue the discussion below.